S. C. Stephens is on a ROLL with these Kellan Kyle books, even though technically this book really wasn’t about Kellan all that much. It was about Kiera being more comfortable with herself, and her relationship with Kellan as they struggle to stay in love despite the challenges life throws at them. 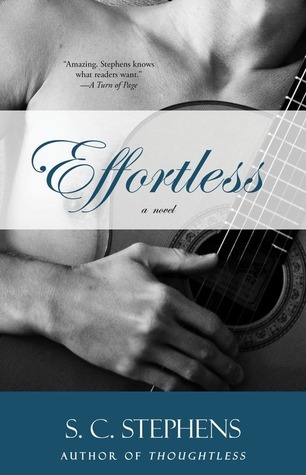 Effortless continues off a little after Thoughtless ends. Everyone is happy in their relationships, it’s all sunshine, lollipops and rainbows. (A tribute to my best friend for always singing that song to me). Their happily ever after takes a quick turn when the D-Bags suddenly get signed on to go on a six month tour with a bunch of other bands. This could be the opportunity of a lifetime for them and Kiera is not going to let Kellan and the band pass it up. In the six months they have to spend away from each other Kiera starts to grow doubtful of Kellan’s loyalty and love when he starts hiding secret text messages and talking to mysterious people on the phone. Even with her friends to help her she finds it hard to cope until someone she never thought she’d see walks again waltzes back into her life. Her ex, Denny. The sequel wasn’t as serious and as dramatic as the first one. I actually didn’t feel the need to punch people in the face as often as I did with the first one. So that’s a plus. I still feel there was a BIT of bad decision making on Kiera’s part, and I’d scream just wishing she’d do things a little differently. Maybe life wouldn’t be so difficult if she did. There was still a lot of heavy emotion, the passion, the love Kellan and Kiera had for each other, and the desire to keep what they had alive even through long-distance separation. Kiera matures a lot in this book, she becomes a little less selfish, maybe retains a bit of childish behaviour but all’s fair in love and war right? A little more trusting and open to others, and becomes more comfortable with her past. How she acted, what she did to hurt people, how she hurt in return, and how she’s going to go about fixing herself and the mistakes she made with Denny as to not repeat them with Kellan.One thing I ABSOLUTELY LOVE about Stephens is the BIG ROMANCE. I wish life was just one big freaking romance. That’s what I want… Unrealistic maybe but a lot of dreams are. Is it wrong for every girl to deserve the sort of love Kellan and Kiera have? Can’t we all just find our Kellan? Maybe he doesn’t exist as the whole package but I wouldn’t mind someone with some of his traits. One of the most important ones being his loyalty and his love. A girl needs that love, that trust, that devotion. Women are insecure beings, or…at least I know I am haha. There’s nothing wrong with a little reassurance now is there? Trust me when I say the effort he puts into making Kiera feel loved even when he’s on tour, no guy would do on the accusation of being too soft. S. C. Stephens has a special something about the way she writes. Simple slice of life romance about the hardships of learning to trust and grow with those you love. She’s absolutely done it again. Given me a book and romance in which I can only ever dream of. A wonderful heartfelt romance that just makes your heart melt. A romance worth all the pain and the hurt because let’s face it, no relationship is easy, and long-distance relationships with people who have complicated pasts and scars only makes it more complicated. I can’t wait to see where her next book Reckless takes us and how Kellan and Kiera’s relationship progresses.